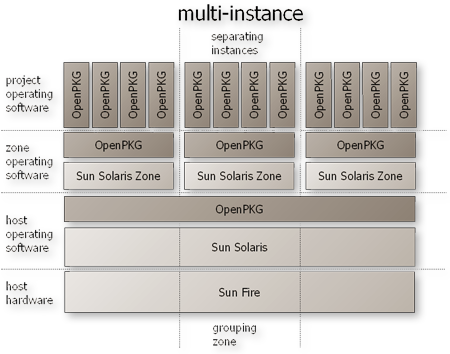 The fully self-contained OpenPKG framework minimizes intrusion to the operating system and has no impact on existing applications. 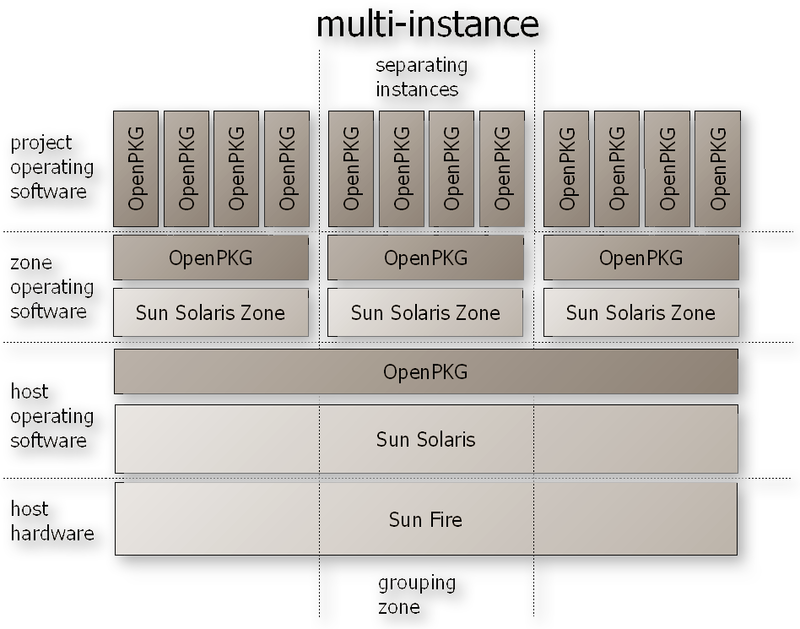 Operating systems virtualization technologies, like FreeBSD Jails, Sun Solaris Zones or Linux Vserver, can be used to further increase separation. These features work optimally in concert with OpenPKG in order to separate security domains, but there is no requirement to use them to achieve plain administration domain separation. For separating administration domains or to increase flexibility, OpenPKG even can can be logically stacked onto itself by installing one instance for basic applications (e.g. OpenSSH, NTPd, Bash, Vim, etc) plus multiple additional instances for project specific applications (e.g. CVS/SVN, Apache, Postfix, etc). Additionally, as a software developer you can choose between the rock-solid OpenPKG-RELEASE versions and the bleeding-edge OpenPKG-CURRENT product lines and deploy them either side-by-side or even mix them on demand.